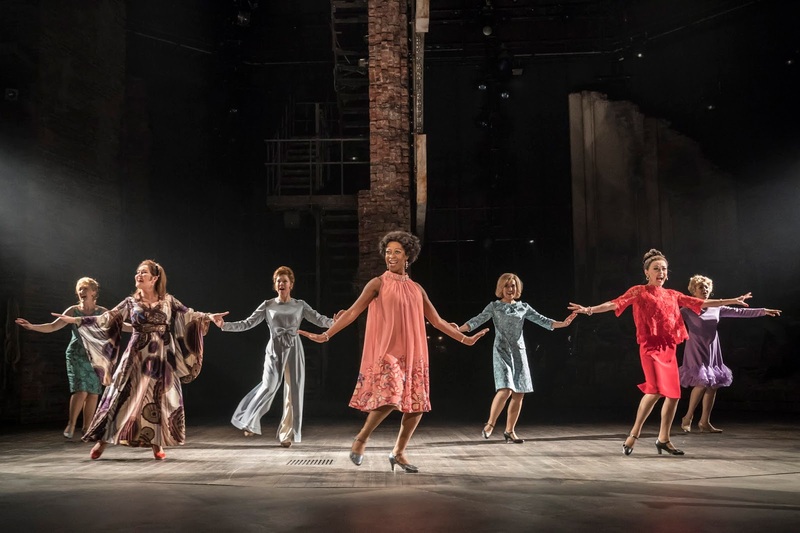 Eighteen months on and with a couple of well placed casting changes Stephen Sondheim’s Follies returns to the National Theatre with the excellence of this devastating musical a breath of fresh air amidst a slew of disappointing recent openings in the capital. What sets Follies apart from so many other current shows is the meticulous detail that Sondheim weaves into his lyrics and melodies. There is an almost Shakespearean genius to the man, such is his ability to pare the essence of love, lovelessness and the human condition down to the barest, bleakest of bones. 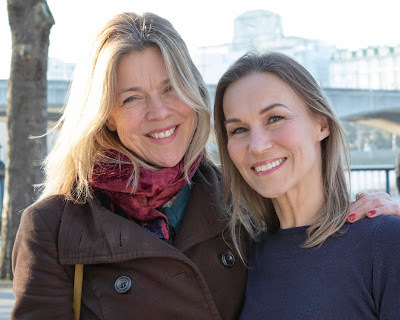 Of Follies’ two leading ladies Janie Dee reprises Phyllis, as Joanna Riding takes over as Sally for this revival. Dee has had time to both sharpen Phyllis’ talons and harden her carapace, her every nuance carefully honed by Cooke’s perceptive direction. Dee’s delivery of Sondheim’s words wield a merciless scalpel into the failures of husband Ben. Phyllis’ big solo Could I Leave You? Proving almost bloody in its brutal dissection of her marriage. Dee savours the wit that Sondheim has bestowed upon her character. Acting through song does not get better than this. Follies was already a five star show back in 2017. With Riding onboard however and with the elegant fragility that she brings to Sally, a level of credible characterisation that was missing on this production’s first outing, the whole piece is lifted to a higher plane. Sally is one of the toughest gigs in the canon, a faded beauty decayed into a desperate housewife, glamorously bewigged and yet ultimately a woman who on the inside, is crumbing as much as the derelict theatre around her. Serving up pathos without a hint of maudlin sentimentality Riding's heartbreaking rendition of In Buddy’s Eyes is a lament to a love that has long since dwindled - while the mental devastation of Losing My Mind scorches in its revelation of her pain. And as she rips the wig from her head during that song’s closing bars, we gasp at the brute ugliness of her depression. Peter Forbes’ Buddy Plummer has grown too. There is a sleazy mania to his performance that is as abhorrent as it is compelling, especially in his Willy Loman-esque take on The Right Girl. Alexander Hanson’s Ben offers up a brief glance into the rise and, more pronouncedly, the fall of an oleaginous statesman. Hanson performs well, but there is a tad more bedding into the role that is needed to fully convince. The show’s supporting roles are all individual treats. Tracie Bennett, ‘still here’ from 2017 as Carlotta, remains perhaps the most diminutive of powerhouse voices to be found in the West End. Oozing classy, sassy cynicism Bennett comes close to stopping the show. She is matched though by her colleagues. Claire Moore is every inch, the most believable Broadway Baby; Felicity Lott and Alison Langer enchant with One More Kiss; Dawn Hope leads the most phenomenal tap line (and credit here to Bill Deamer’s immaculately conceived and drilled choreography throughout) in Who’s That Woman - and a further nod to Bennett who, in a display of sheer bloody stamina segues seamlessly from that number into the demands of I’m Still Here. 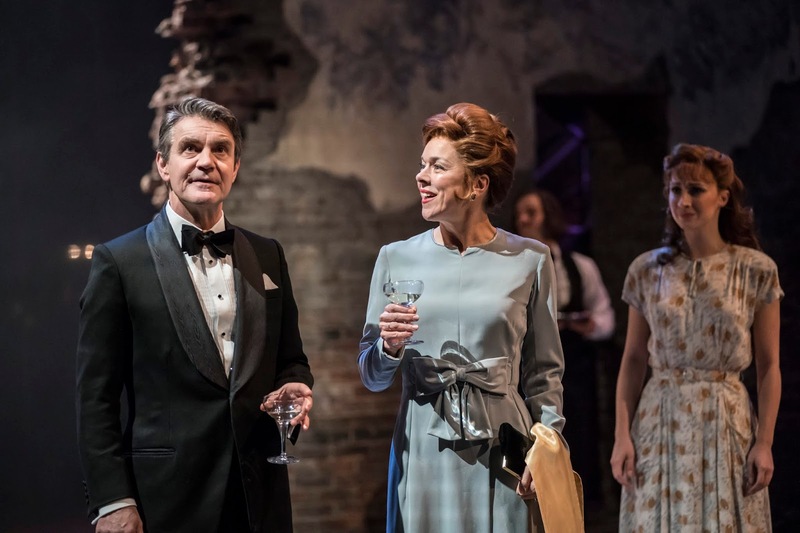 The ghost quartet of the leading roles are marvellous with the ever-excellent Gemma Sutton, together with Christine Tucker, Ian McIntosh and Harry Hepple all offering the necessary passion, scorn and incredulity to make their ghost roles take flight. 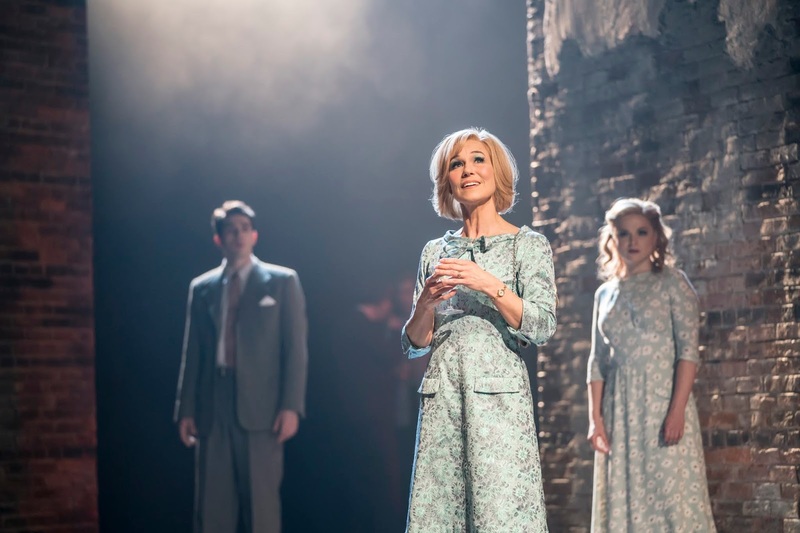 It is not just Follies’ writing, but also the National’s lavish production values that define this show as a gem. 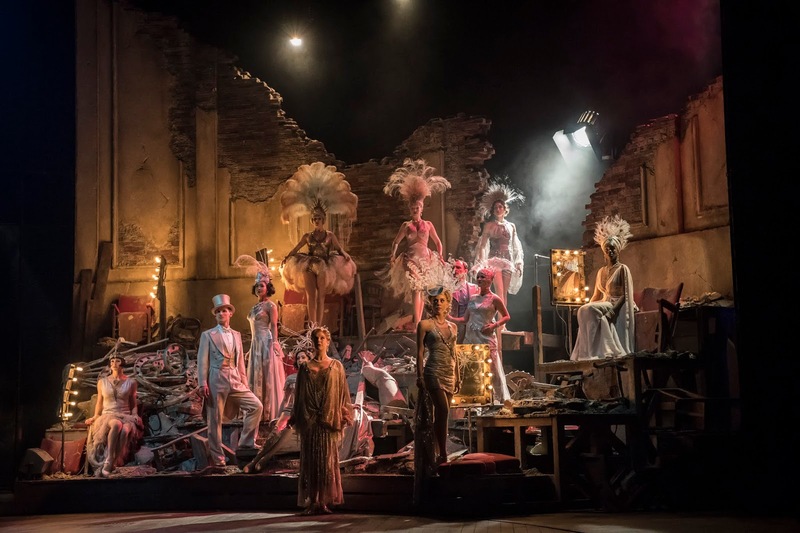 Vicki Mortimer’s designs deftly blend the decay of the Weismann Theatre into the glamour of the ghosted numbers, with the subtle magnificence of the Olivier’s drum revolve taking the show through both the battered Broadway building as well as the decades, almost imperceptibly. Nigel Lilley's 20-piece orchestra is a soaring delight throughout. A musical can be judged on narrative, music, song and dance, with Follies scoring top marks across the board. This revival offers an unmissable glimpse into the heaven and hell of humanity. Amidst the horrors of 9/11, there were pockets of human kindness and charity. So it was for the tiny Newfoundland town of Gander who when the United States' airspace was shut down after the four aircraft-based terrorist attacks, found itself having to accommodate 38 unexpected jetloads of passengers, comprising some 6,000+ souls (or “Come From Aways” as the locals call outsiders), for the best part of a week. Such a flood of humanity was bound to throw up all sorts of issues ripe for a musical theatre treatment – and so it follows in Irene Sankoff’s and David Hein’s composition. Numerous threads emerge, including a love that evolves between two passengers and a neat little tale of a Gander local who realises that there were likely to have been animals travelling in the planes’ cargo holds and rescues as many as she can. Throughout the one-act show (that runs for under two hours) there’s much to warm the cockles of most of the hearts in the audience. But for all the bitter-sweet vignettes, punches have been pulled. None of the grimmer or more tawdry aspects of what might have unfolded between 6,000 folk thrown together for 6 days (and nights) are explored and while the musical rightly highlights the shameful “othering” that one of the Come From Aways, a Muslim chef was subject to, it offers no comment whatsoever upon the ideology of hate that brought the 9/11 nightmare into being in the first place. 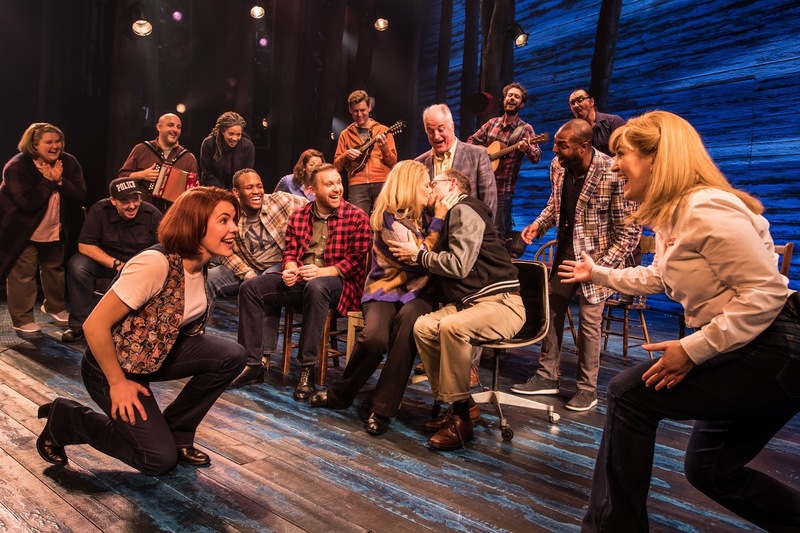 A sung-through piece, the numbers for the most part are tuneful yet forgettable – though that should not detract from the onstage excellence of both cast and band. A truly ensemble show, with no featured actors and all the performers listed alphabetically, standout work comes from Rachel Tucker as an airline pilot and the ever reliable Clive Carter playing all manner of wise and elderly characters. Noteworthy that all of the cast interchange between various roles throughout the evening, doing so convincingly and instantaneously in a flawless set of performances. Flawless performances however do not necessarily make for a stimulating night. For while Gander’s generosity was unhesitating and generous, one might perhaps have expected the same response from any kind-hearted community around the world. One only has to witness the communal response say, to London’s recent Grenfell Tower tragedy or the outpourings of support that flood in for other disasters, to realise that the Newfoundland folk are not alone in their selflessness. And rallying to support the requirements of (even a few thousand) disoriented travellers, albeit from around the globe, doesn’t quite match up to the heroism say, of New York’s firefighters – many of whom gave the ultimate sacrifice on that most horrendous of days. Come From Away is unquestionably wonderfully performed, but its schmaltzy set pieces fail to move. For a half-term offering, the National Theatre’s Dorfman stage hosts the return of The Winter’s Tale, in a production that is stripped down and recommended for children of 8 and over. While most of the performances are charming, director Ruth Mary Johnson should have made more of Joseph Adelakun’s Leontes. The king’s cruelty and misogyny are complex themes meriting more careful exploration, even in a show for a younger audience, than are afforded here. The stagecraft in the round is imaginative, the music (if not the disco beat), a delight and, to be fair, at only an hour in length the timing is spot-on too. Layla, my 8 yo co-reviewer rated The Winter’s Tale as good. 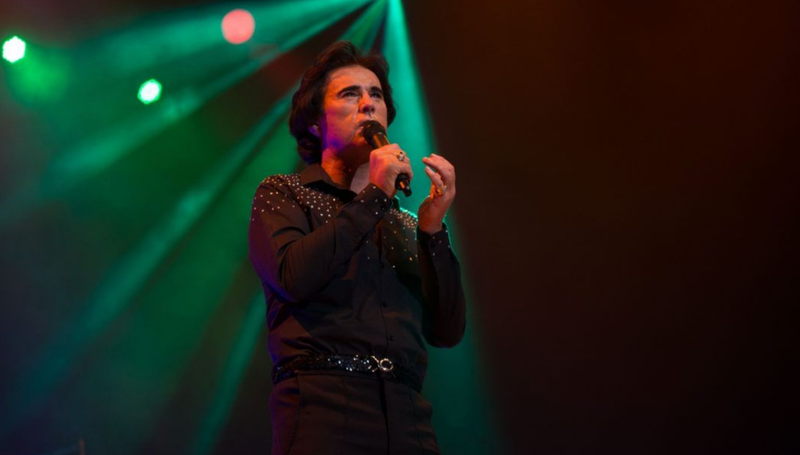 The producers of Thriller Live - now in its tenth year - presented the soulful and hearty vocals of Fisher Stevens as Neil Diamond in Beautiful Noise, on the West End stage for the first in a series of occasional future performances. This sweet gig however is strictly for Diamond fans who want to celebrate the life and music of the infamous solitary man, in the company of a live band and as much nostalgia as they can muster. Telling the story of Neil Diamond’s rise to fame amid the birth of rock n roll and the glory of New York’s Brill Building, Stevens recounts countless Neil Diamond hits including ‘Cherry, Cherry’, ‘You’ll Be A Woman, Soon’ and ‘Sweet Caroline’ - arguably the one that everyone was waiting for. It’s not hard to see how Diamond became one of the best songwriters in America, recognised to this day. Lyrically stunning but lesser known songs ‘I am... I said’ and ‘Play Me’ further reminded the audience just what a talent he is, in case there was any questioning… probably not given that Stevens recognised most of the front few rows of the audience from his tours up north! Despite the incredible repertoire, the show’s accompanying presentation of stock footage and photographs ultimately gave Beautiful Noise the feel of a wet evening at Butlins. This sensation is only re-inforced by it taking place amidst Shaftesbury Avenue's starry line up of hit shows, to say nothing of being performed on the stage of (the electrifying) Thriller Live on its night off. There is no doubting Diamond’s talent, nor Stevens’ prowess as a tribute singer too, (complete with shiny shirts and growling filler anecdotes) but there’s simply not enough substance here to warrant the ticket price to anyone other than die-hard fans. A lacklustre night, albeit of gorgeous music and strictly for those who prefer both their jeans and their songs sung, blue. It may well have been a bloody good idea to stage Dracula in the London Library, amidst the very books and shelves that more than likely inspired Bram Stoker as he composed his Gothic horror classic. But much like the blood that the infamous Count sucked from his victims, so has Creation Theatre’s take on the tale drained nearly every drop of passion from Stoker’s beautifully penned original. Helen Tennison’s production assumes an audience familiarity with Stoker’s tale and characters and notwithstanding an overly detailed synopsis included in the pricey (£4) programme, it is left to the play’s two actors, Sophie Greenham and Bart Lambert to assume a variety of roles and costumes as they attempt a curiously retrospective interpretation of the story. Unfortunately, their numerous characters are barely introduced, let alone (pun alert) fleshed out, and whilst the play’s setting within the Library’s grand Reading Room is unquestionably magnificent, the show itself proves a tedious and mediocre melodrama. No blood can obviously be splashed upon the hallowed walls of the St James’s Square building and so the special effects, such as they are, are conveyed by way of video projections onto the room’s curtains and pillars. The videos however have an insipidly low luminescence. This, combined with a directorial blandness that ignores for example the (very different) geniuses of a Werner Herzog or John Landis, means that these mini movies fail to frighten. Hell, even a spot of Hammer Films’ kitsch would not have gone amiss in a bid to give the evening even the faintest hint of a pulse. All the while Greenham and Lambert’s performances waver between deadly earnest and parody in a contrast that just doesn't work. This website has long argued that good horror demands the suspension of the audience’s disbelief, ideally from a great height. 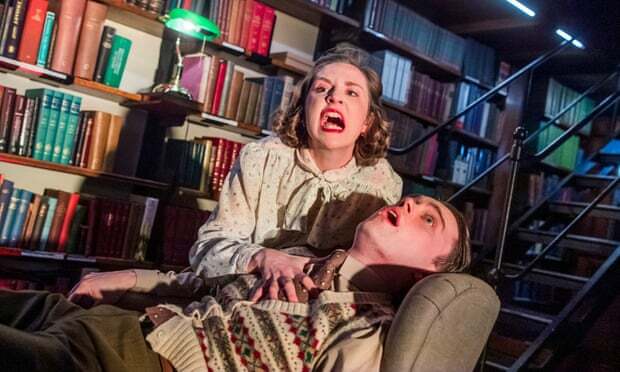 Dracula at the London Library, albeit well intentioned, makes for anaemic theatre. In the #MeToo era Madeleine Gould and Joel Samuels have written what could have been an interesting take on the subject of consent. 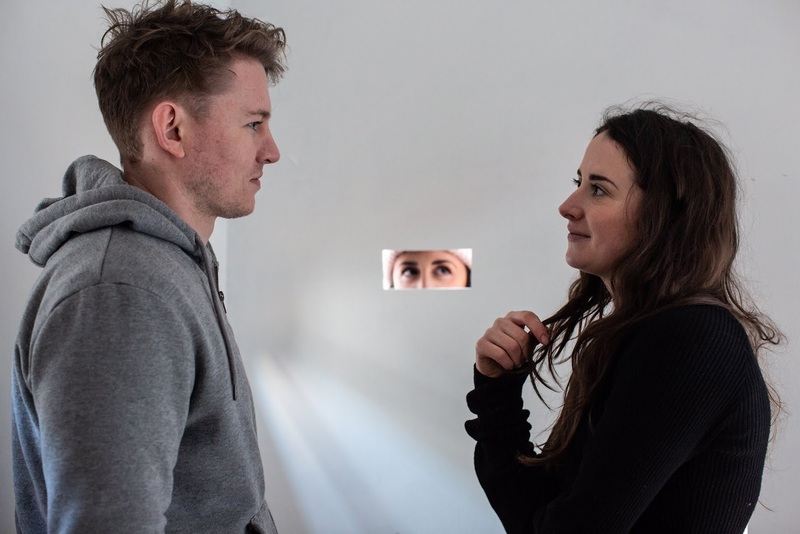 A too short two-hander immerses the small audience into monologues from both actors, before they then meet on their first date. The casts, and their respective genders and sexualities, alternate throughout the run - so the gig reviewed here could well be very different in its interpretation to audiences on other nights – performing on the night of this review were Tom Campion and Edie Newman. Timely perhaps, but in its current unsatisfying iteration, Greyscale lacks colour.